Newsletter: Estate Taxes: Should a Trust Own Your Life Insurance? : Estate Taxes: Should a Trust Own Your Life Insurance? If you anticipate that your estate may be subject to estate or inheritance taxes — and you have illiquid assets that you would like to keep in the family, such as shares in a business, a farm, or other valuable real estate — you might consider purchasing a life insurance policy to provide liquidity. The death benefit is free of income tax, but if you own the policy or it is payable to your estate, the proceeds could be counted as an asset in your taxable estate. In this case, it might also be useful to create an irrevocable life insurance trust (ILIT). An ILIT could keep policy proceeds out of the taxable estate and provide ready cash to help pay taxes on any estate assets that exceed the exemption amount. To use this strategy, you should consult with your legal counsel. You would fund the ILIT, and the trustee would use the money to purchase a life insurance policy that is owned and controlled by the trust. Typically, you would gift additional money to the trust each year, and the trustee would use the money to pay premiums on the policy. You may also transfer any life policies you already own to an ILIT, but you must survive for three years after the transfer or the proceeds will be taxed as if you are still the owner. Keep in mind that once the ILIT is created, you cannot change the terms or beneficiaries of the trust, and you must give up control of the life insurance policy. People insured under policies owned by the trust cannot serve as a trustee. All life insurance premiums must be paid by the trust. 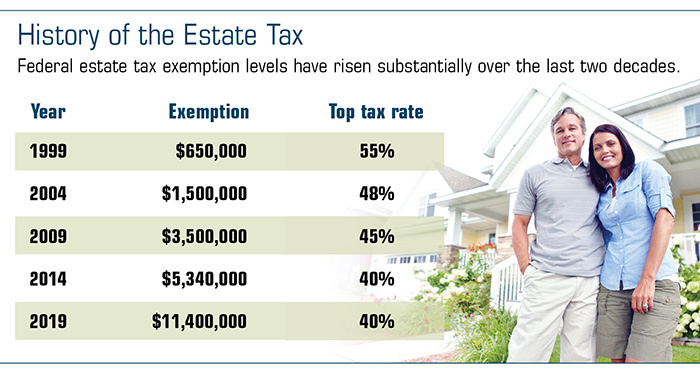 If you already have an ILIT to help offset potential estate tax liabilities, you may need to review your insurance strategy in light of these higher exemption levels. If you decide to stop making gifts to the trust to fund premium payments, the trustee must choose a course of action that complies with the terms of the trust and protects the interests of the beneficiaries. The cost and availability of life insurance depend on factors such as age, health, and the type and amount of insurance purchased. In addition to premiums, there are other expenses associated with the purchase of life insurance, such as mortality and expense charges. If a policy is surrendered prematurely, there may be surrender charges and income tax implications. Before implementing a strategy involving life insurance, it would be prudent to make sure that you are insurable.